Introduction: Laparoscopic intragastric resection (IGR) became a good surgical option with its gastric functional preservation for intraluminal growth submucosal tumor (SMT), gastrointestinal stromal tumor (GIST) and early gastric cancers those failed endoscopic mucosal resection (EMR). On the other hand, single port access (SPA) surgery is getting popular with its cosmetic and less pain benefit for the patients. 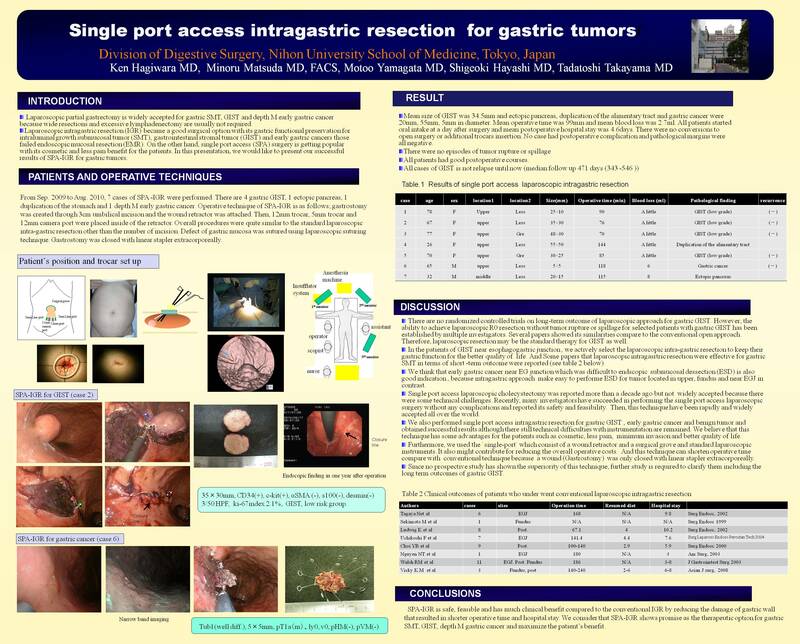 In this presentation, we would like to present our successful results of SPA-IGR for gastric tumors. Patients and Operative technique: From Sep. 2009 to Aug. 2010, 7 cases of SPA -IGR were performed. There are 4 gastric GIST, 1 ectopic pancreas, 1 duplication of the stomach and 1 depth M early gastric cancer. Operative technique of SPA-IGR is as follows; gastrostomy was created through 3cm umbilical incision and the wound retractor was attached. Then, 12mm trocar, 5mm trocar and 12mm camera port were placed inside of the retractor. Overall procedures were quite similar to the standard laparoscopic intra-gastric resection other than the number of incision. Defect of gastric mucosa was sutured using laparoscopic suturing technique. Gastrostomy was closed with linear stapler extracorporeally. Results: Mean size of GIST was 34.5mm and ectopic pancreas, duplication of the alimentary tract and gastric cancer were 20mm, 55mm, 5mm in diameter. Mean operative time was 99min and mean blood loss was 2.7ml. All patients started oral intake at a day after surgery and mean postoperative hospital stay was 4.6days. There were no conversions to open surgery or additional trocars insertion. No case had postoperative complication and pathological margins were all negative. Conclusions: SPA-IGR is safe, feasible and has much clinical benefit compared to the conventional IGR by reducing the damage of gastric wall that resulted in shorter operative time and hospital stay. We consider that SPA-IGR shows promise as the therapeutic option for gastric SMT, GIST, depth M gastric cancer and maximize the patient’s benefit.